Bus from Ipoh to Sungai Petani is one of the important routes to travel between the two places in Malaysia. With limited train schedule and no flight service available from Ipoh to Sungai Petani, bus become the most preferred mode of transportation to travel from Ipoh to Sungai Petani. 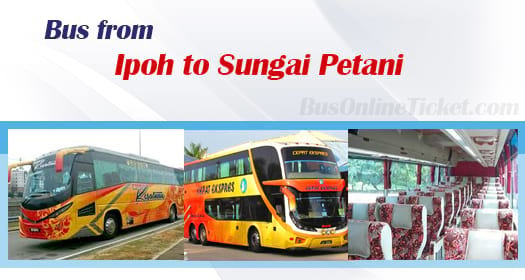 Kesatuan Express and Cepat Express are the two service providers supplying bus service from Ipoh to Sungai Petani. Cepat Express is the dominant player in this route service by having 4 daily departures while Kesatuan Express is only providing 2 daily departures from Ipoh to Sungai Petani. The first bus service is starts at 12:25am. The last bus service is at 5:00pm. In between, there are bus service at 3:00am and 11:15am. Please note that there are no bus services in the afternoon session. The estimate of the travel time from Ipoh to Sungai Petani is about 2.5 hours depending on the road traffic condition. Washroom will be given upon request from the driver during the journey. Please note that all the buses in Malaysia have no toilet facilities on board. The bus ticket price from Ipoh to Sungai Petani is charging in a range of RM 18.60 to RM 26.00. Kesatuan Express bus fare is higher because they are operating with VIP coach installed with spacious seat. For those travellers prefer to travel with spacious, Kesatuan is the choice. As for the budget travelers, Cepat Express bus fare at RM 18.60 is economical. But travellers choosing Cepat Express would have to settle with the 40-seater or 50-seater coach. The pick-up point is located at Amanjaya Bus Terminal which is located about 20 minutes away from the Ipoh city. Passengers could take city bus or taxi from Ipoh city to Amanjaya Bus Terminal. The drop off point in Sungai Petani is located at Sungai Petani Bus Terminal. Grab your bus ticket from Ipoh to Sungai Petani now with BusOnlieTicket.com. Online booking in BusOnlineTicket.com is simple, reliable, and convenient. Instant email confirmation upon payment is successful in BusOnlineTicket.com.